About 4 years ago I won a memorable hand of poker at Las Vegas’ Bellagio Casino (the one with the musical fountain display out the front, and which George and Brad robbed in Ocean’s Eleven). Two red aces and $200 better off, and I’ve not since then allowed myself the chance of losing these winnings by making a return visit. I enjoy the street banter in Saigon. 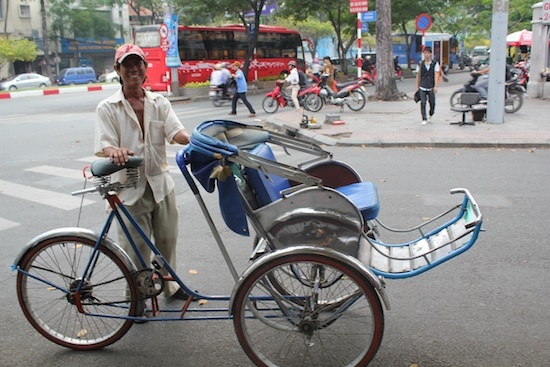 Cyclo drivers can be particularly fun. They’ll spot you on the pavement, with family entourage in tow, and beckon you over to their rickety mobile contraption. Seemingly oblivious to your own counter gestures – where you shake your head and point incredulously to your two children, their buggies and the assortment of other luggage that you seem to have accumulated walking down the street – they will be undeterred, remaining all smiles and nods and encouraging hand gestures.